Privet iz Krime! Greetings from Crimea! Join me as I team up with an expedition of Ukrainian underwater archaeologists in search of shipwrecks along the northern coast of the Black Sea. Our expedition will be diving until mid-August, and I'll update you on our progress every few days, as well as give you a look into a fascinating region rarely visited by Western tourists. Feel free to send any questions you may have to kristin@archaeology.org, and I'll try to answer them in my next posting. Davay! We're off! A crossroads of culture and trade for millennia, and once known as the "Soviet Riviera," Crimea is now an autonomous republic within Ukraine. A village west of the Genoese fortress of Sudak, Novy Svet is where my team dived in 1997 on a thirteenth-century wreck in the harbor, which is flanked by twin peaks named Eagle and Hawk. A dish of boiled buckwheat and a day of briefings and catching up with colleagues, then a dive on the Novy Svet shipwreck. We begin our hunt for two Venetian ships that sank off nearby Mis (Cape) Meganom in 1431. Once I connected to the server, I had to immediately cross the two wires, or I would be disconnected. I removed the phone, set up the laptop and crossed my fingers. Loscha watched me with amusement. "This is terribly James Bond-ish, yes?" he joked. We divert our attention from Meganom for a couple of days to follow up on fishermen's reports of old ceramics found in a bay west of Novy Svet. My trip to Sevastopol would have been impossible only five years ago. 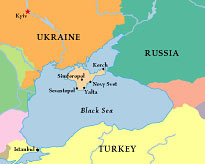 As the base for the Soviet Black Sea fleet, Sevastopol was off-limits to all foreigners and most non-resident citizens, and the "closed city" was not opened to outsiders until 1996, when Russia and Ukraine finally reached an agreement that allowed Russia to maintain its fleet in the city's harbors. I returned to Novy Svet to discover a new glitch in our plans. The owner of our boat was unexpectedly called back to Kiev, taking the boat with him. 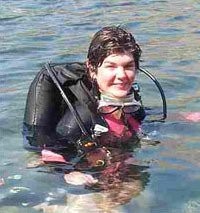 For more information on the Institute of Nautical Archaeology, visit ina.tamu.edu.